Seeds are the foundation of agriculture. Technology has modernized much of farming's day-to-day operations, but without a steady supply of high-quality seed, yields and crop quality would be greatly decreased. Seed quality plays an important role in the production of agronomic and horticultural crops. Characteristics such as trueness to variety, germination percentage, purity, vigor, and appearance are important to farmers planting crops and to homeowners establishing lawns and gardens. Achieving and maintaining high seed quality is the goal of every professional seed producer. This publication presents basic facts about seed, seed quality, and seed laws. This information can help seed producers, farmers, and homeowners understand the important role that seed plays in producing superior crops, landscape plants, and lawns. The process of seed development begins within the flower, the plant's reproductive structure. The flower is a modified leaf structure and can be both male and female. The female part is the pistil, and the male part is the stamen. One flower may contain the pistil and stamen, as in beans, or they may occur in different flowers, as in corn. A typical flower and its parts are illustrated in Figure 1. The pistil has a top portion (stigma), a middle portion (style), and a lower portion (ovary). The ovary may contain one or more ovules. The surface of the stigma produces a sweet, sticky solution as it becomes receptive to pollen fertilization. Pollen is produced in the anthers at the ends of the stamen. Pollination occurs when pollen grains come into contact with the stigma. Wind and insects are largely responsible for the transfer of pollen from the anthers to the stigmas. Methods of transfer differ from one species to another. If conditions are favorable, pollen grains begin to grow on the stigma surface and form pollen tubes. The pollen tube grows down the style and into the ovary, where it comes into contact with the ovule. Male gametes are transferred through the pollen tube into the ovule. Fertilization occurs when the male gametes unite with the female egg in the ovule. After pollination and fertilization, ovules develop into seeds. In self-pollinated plants, pollen produced within each flower pollinates the stigma of the same flower. Cotton, barley, wheat, oats, tobacco, soybeans, okra, peanuts, and peppers are examples of self-pollinated crops. In cross-pollinated plants, the pollen grains pollinate flowers other than the one from which they originated. Examples include corn, rye, tall fescue, alfalfa, carrots, cucumbers, squash, and onions. Fertilization occurs shortly after pollination and begins the process of seed development. Early stages in the development of strong plants depend on favorable growing conditions. Seed quality, on the other hand, is largely dependent upon environmental conditions and the promptness with which the seed is harvested after it matures. Varietal purity is heavily influenced by the type of pollination. Self-pollinated plants need be only a few feet apart to prevent the pollen of one plant from pollinating nearby plants of another variety. Cross-pollinated species, on the other hand, may need to be separated by several hundred feet to isolate them from plants of different varieties. In self-pollinated crops, stray pollen from an off-type plant can pollinate flowers on several other plants, thus reducing varietal purity. Off-type plants should be removed before pollination occurs. In cross pollination, pollen is moved long distances. Thus, a single off-type plant in a seed field can pollinate flowers on hundreds of other plants. Varietal purity is not easily achieved. It requires timely and careful roguing (removal) of off-type plants. Seed certification agencies and seed breeding companies use field inspection programs to maintain varietal purity. Knowledge of seed structure can help in understanding how seeds respond during harvesting, conditioning, germination, and seedling emergence. Seed can be divided into two major classifications, monocots (monocotyledons) and dicots (dicotyledons), based on the number of cotyledons (seed leaves) in a seed. Monocots contain one cotyledon, whereas dicots have two. Examples of plant species having monocot seeds are grasses–such as small grains, corn, or turfgrasses–and other crops such as onions. Plants with dicot seeds include legumes–such as peas, peanuts, soybeans, and clover–and other crops such as cotton and tobacco. 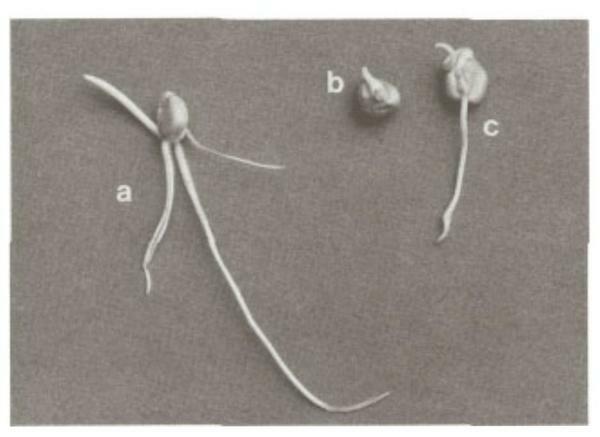 Seeds are composed of three basic structures: (1) the seed covering (seed coat or testa); (2) the embryonic axis (embryonic root or radicle and shoot or plumule); and (3) supporting tissues (the cotyledons and endosperm). The structures for monocots and dicots are illustrated in Figure 2. If unbroken, the seed coat regulates water uptake by mature seeds. Variations in seed covering characteristics, especially in dicots, often affect the quality of seed when exposed to adverse weather. Some seeds, such as peanuts, have an extremely soft and delicate seed covering. This covering can easily break or slip and expose the embryo, making it susceptible to injury, deterioration, and pathogen attack. Other seeds have extremely hard coverings that protect the seed from almost everything. Common weeds such as puncturevine, dock, knotweed, and pigweed are examples of these tough seeds. It is no wonder that most common weeds survive so long scattered across the land or buried in the soil. Lotus seeds have survived for many hundreds of years because of their tough, hard covering. The embryonic axis normally includes the miniature plant, consisting of the root and shoot. Cotyledons and endosperm are usually considered supporting tissues. They are useful to the developing plant as a reserve food source through the course of germination and emergence until the plant can make its own food through photosynthesis. Supporting tissues in monocots are composed mostly of nonliving, starchy materials, whereas such tissues in dicots are composed of mostly fats and oils. The location of seed structures plays an important role in determining the seeds’ susceptibility to mechanical injuries and weather damage. The embryonic axis is often just below the seed covering. Impacts to the embryonic axis can cause severe damage, resulting in abnormal seedlings or death of the seed. Peanut and soybean seeds can be damaged easily. Figure 2. The major botanical structures of monocotyledonous (for example, corn) and dicotyledonous (for example, soybeans) types of seed. Seeds come in many sizes and shapes. They range in size from the micro-miniature orchid seed, as small as a particle of dust, to the gargantuan double coconut seed, over 1 foot long and weighing many pounds. Shapes vary from the simple, round tobacco seed to the complex, aerodynamic, winged maple seed. Some seeds are hairy, such as the cotton or thistle. Others, like grass, have long spikes. Some have thorns. The dispersal mechanisms of seeds range from the simple dropping of the seed from the parent plant onto the ground to the more exotic ways such as scattering by wind or “shooting” from the plant. The tumbleweed scatters its seeds in the wind as it rolls along the ground. Light, puffy seeds like those of the thistle and dandelion and winged seeds like those of the maple and pine can ride the wind for great distances. Some seeds, such as the cocklebur, hitch rides on passing animals. Among the most exotic dispersal mechanisms are the “shooting” seeds of plants such as mistletoe or touch-me-not that are “spring loaded” and flung from the parent plant into the air. For seeds used in farming and landscaping, the primary dispersal mechanism is the planter. This mechanism can be very simple such as the primitive dibble stick used to scratch open a furrow or poke a seed hole into the soil. At the opposite extreme is the modem mechanized planter that plants four or more neatly aligned rows at one time. Like all living organisms, seeds are composed of many different types of chemicals, but seeds are unique in that they are a storehouse of chemicals that are used as food reserves for the next generation plant. These chemical foods also serve as a significant part of our food supply. Seeds store three major classes of chemical compounds: carbohydrates (sugars), lipids (fats and oils), and proteins. The quantities of these compounds stored in seeds vary with the type of seed, as shown in Table 1. Seed chemicals can be very useful. Certain seed oils are particularly well suited to cooking. A prime example is peanut oil, highly prized as one of the best cooking oils. Others are particularly well suited to lubrication. Seeds of the jojoba (a little known but very useful desert plant from the American Southwest) contain an oil that has lubricating properties as good as those of the finest sperm whale oil. Seed oils are used to make soap, paint, printing inks, and other industrial supplies. In the case of proteins, seeds may not have the ideal composition in terms of human nutritional needs. Proteins are made up of long chains of amino acids. Some seeds do not have the optimum quantities of amino acids for human nutrition. For example, corn proteins are generally low in the amino acid lysine but relatively high in the amino acid methionine. In contrast, soybean proteins are relatively high in lysine but somewhat low in methionine. When corn and soybean seeds are used together, a nutritionally satisfactory balance can be obtained. Most seeds are not high in protein but are high in carbohydrates or lipids. Soybean (high in protein and relatively high in lipids) is the exception rather than the rule. The seeds of most plants store their food reserves mainly in the form of carbohydrates or lipids. Through careful breeding and selection, the levels of seed storage reserves can be modified. In this age of biotechnology, it may be possible to breed a “designer” seed plant with the correct levels of carbohydrate, lipids, and protein to meet human nutritional and industrial needs. Table 1. Approximate Chemical Composition of Various Kinds of Seed. Germination is the emergence from the seed and development of those essential structures that under favorable conditions produce a normal plant. Germination is more than just the protrusion of the root or shoot from the seed covering. It is important that all of the seedling structures necessary for continuation of the next generation be present and healthy. Field Emergence is the elongation of the seedling axis resulting in protrusion of the seedling shoot from the soil. Viability is the potential to germinate. A nonviable seed will not germinate under any conditions. Viable and a nonviable seeds may look exactly the same. Dormancy is the state of nongermination in viable seed. During this period, germination is blocked by conditions within the seed. Dormant seeds are often thought of as being in a resting state. Dormancy is broken when the seed is exposed to specific conditions. The condition may simply be the passage of time, or it may be the removal or breaking of the seed coverings, a cold overwintering, or the effects of light or hormones supplied to the seed. Minor and subtle changes in the physical or chemical properties of the seed are usually required to break dormancy. A seed may take up water and look fully able to germinate but, because other necessary conditions are not present, may fail to germinate. Various seed characteristics result in different germination and seedling emergence patterns. a favorable oxygen supply to the seed. Note that favorable conditions must be present. Some seeds may require specific light conditions. Also, the seed's dormancy must be broken for germination to proceed. Germination occurs in several steps. The first is the absorption of water. Water begins certain biochemical processes within seed that accelerate cell activities. The minimum moisture level at which germination begins is known as the critical moisture level. Critical moisture levels vary among crop seed. Most starchy seeds (monocots) will begin germination when they have a moisture content of approximately 30 percent. Most oily seeds (dicots), however, will not begin germination until they have a moisture content of at least 50 percent. Germination will not occur above or below the critical temperatures. Each species has a minimum, an optimum, and a maximum temperature for seed germination. Most species have a minimum germination temperature of approximately 55°F (13°C) and a maximum germination temperature of approximately 110°F (43°C). The optimum temperature is usually from 75 to 85°F (24 to 30°C). Seeds of plants such as beets, corn, cotton, okra, peppers, soybeans, and turnips sometimes germinate better with alternating temperatures than at a constant temperature. Favorable alternating temperatures for the seed of a given crop tend to follow the average day-to-night temperatures during the planting season. Lack of oxygen is not usually a limiting factor for germination. However, wet or soggy soils may not contain enough oxygen for germination to begin. Seeds planted in such soils will absorb water quickly and have a tendency to decay. Most agricultural seeds germinate equally well with or without light. However, many seeds such as those of tobacco, lettuce, and many types of grass, will germinate best in light. In contrast, onion seeds germinate best in darkness. The internal conditions of seed, such as soundness and vigor, as well as the environment, affect the rate of germination. Seed vigor can be affected by maturity, age, mechanical injuries, disease infection, preharvest weather, and storage environment. Adverse weather conditions after planting regularly influence the germination processes by affecting moisture, temperature, and oxygen levels. Weather patterns sometimes make early spring or late fall planting extremely risky. 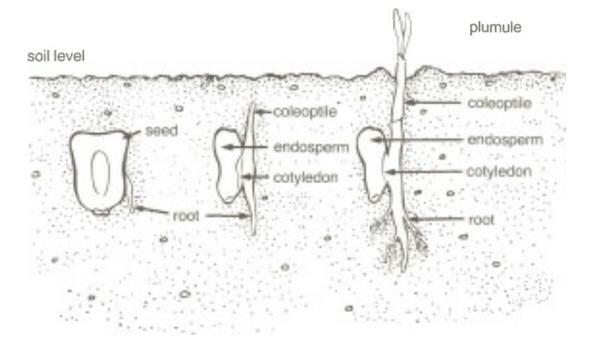 Once cell activity is initiated, the root is the first structure to emerge from the seed coat. Root growth is a result of both cell division and elongation. Hypocotyl growth is mainly a result of cell elongation. Shortly after root growth begins, the shoot meristem emerges from the seed coat and continues development by cell division and elongation. Different species exhibit different seedling emergence patterns. The emergence patterns of soybean, pea, and corn seedlings are shown in Figure 3, Figure 4, and Figure 5. The illustrations represent three basic emergence patterns for agricultural seeds. In soybeans and other crops such as cotton, clovers, squash, and radishes, root growth occurs by cell division and enlargement of the root (Figure 3a). As growth continues, the hypocotyl elongates by cell enlargement, and the midsection emerges from the soil (Figure 3b). The seed coat usually remains below ground. As the bent hypocotyl elongates, it gradually pulls the cotyledons above ground (Figure 3c). During the critical stage when the hypocotyl is still arched above ground and is pulling the cotyledons upward, damage to the hypocotyl can easily prevent seedling emergence. Figure 4 shows the emergence pattern for peas. 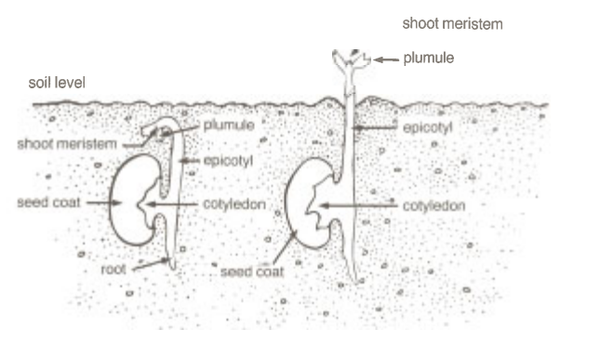 Elongation of the root and plumule occurs almost simultaneously (Figure 4a). 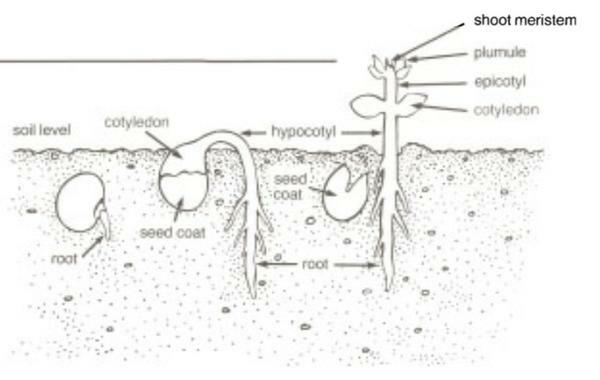 The cotyledons and the seed coat remain below ground at planting depth, and the epicotyl advances upward through the soil (Figure 4b). When seedling emergence follows this pattern, a weakness in the epicotyl may cause emergence failure. Other crops with a similar emergence pattern include vetches and peanuts. Peanut cotyledons, however, tend to advance toward the soil surface but usually remain slightly below it. The emergence pattern of corn is illustrated in Figure 5. Most monocots have this kind of emergence pattern. The elongation of the root and the coleoptile (penetrating organ) occurs almost simultaneously (Figures 5a and 5b). The seed remains underground at planting depth, and once the coleoptile (which is pointed like a pin) emerges above ground, it stops growing. The plumule continues to develop and grow upward through the coleoptile (Figure 5c). In this emergence pattern, a weakness in the coleoptile can cause emergence failure. Figure 3. Field emergence pattern of soybean seedlings. Figure 5. Field emergence pattern of corn seedlings. One of the official statutory test required for labeling purposes is the standard germination test. The rules for conducting this test are established by the Association of Official Seed Analysts (AOSA) and set forth in a handbook entitled Rules for Testing Seed. Most seed testing laboratories follow these rules. The AOSA has also set standards and procedures for the use of the tetrazolium test as an estimate of viability and germination. The standard germination test measures the number of normal seedlings produced by a sample of seed under optimal conditions. Germination is reported as the percentage of seed producing normal seedlings. Normal seedlings are those that produce a vigorous set of primary and secondary roots; have a healthy hypocotyl, epicotyl, and cotyledon; and produce a healthy shoot meristem. Abnormal seedlings are considered nongerminative in the Standard Germination Test, and would not be counted in the total percent germination for that sample. See Figure 6. Some seed producers use tetrazolium, cold test, growth rate, or some other testing technique to estimate seed vigor. These tests are designed to evaluate the seed’s ability to germinate and grow under less than favorable conditions. Figure 6. Corn seedlings with (a) normal seedling structures (that is, healthy shoot and root), (b) abnormal root structure, and (c) abnormal shoot structure. Seed vigor is the property that gives seed the potential for rapid and uniform emergence and development of normal seedlings under a wide range of field conditions. Tests for vigor go beyond the germination tests conducted under controlled, favorable conditions in the laboratory to predict seed performance under practical conditions that may be encountered when the seed is planted in the field. The concept of seed vigor has recently been officially defined and accepted as a testing guideline for seed. The standard germination test, in contrast, has been in use for many years. Although vigor testing is not required by law for labeling of seed, many seed producers use vigor tests as a quality control to ensure that the seed produced is of high quality. Many factors, such as maturity level at harvest, age of the seed, mechanical injuries, disease infection, and storage environment, can influence seed vigor. Genetic factors also influence vigor. If two lots of seed have the same germination percentage but one is of high vigor and the other is of low vigor, a difference in the germination speed, seedling growth, Or emergence can be seen. For example, gemination test results on two peanut seed lots were 99 percent (lot A) and 98 percent (lot B). In the field, seed lot A had a 98 percent emergence, whereas seed lot B had an emergence of only 60 percent. 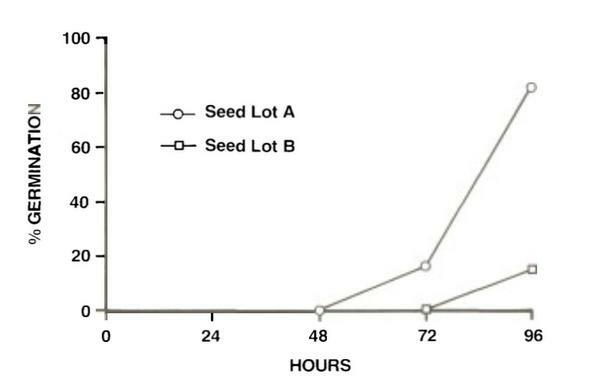 Underfavorable germination conditions, the two lots have only a small difference in speed of germination (Figure 7). Under unfavorable (cool) conditions, the two lots have a great difference in the speed of germination, a result of their difference in seed vigor (Figure 8). Figure 7. Speed of germination in laboratory vigor testing of two comparable peanut seed lots under favorable conditions. Figure 8. 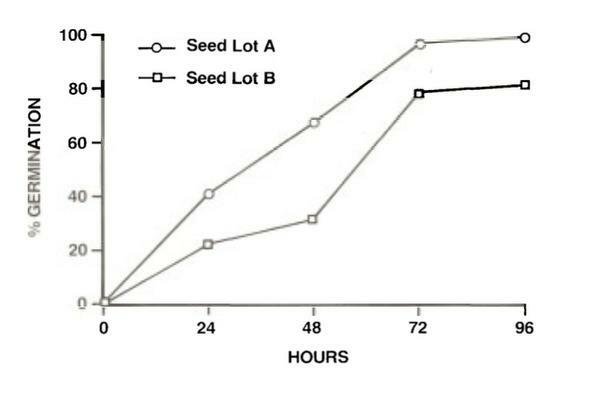 Speed of germination in laboratory vigor testing of two comparable peanut seed lots under unfavorable (low temperature) conditions showing the difference due to seed vigor. Trueness to variety indicates that the seeds in a bag are of the variety stated on the label. Trueness is usually determined by records of seed sources and by field inspections of the plants that produce the seed. Field inspections are conducted by certification agencies or representatives of commercial seed companies. Germination potential and vigor are at their highest potential when the seed reaches physiological maturity. But because seed moisture is so high, most crops are not ready to be harvested at that time. It is important that seed be harvested as soon as the moisture content decreases to a safe level (see Table 2). After maturity, germination potential and vigor begin to deteriorate. The rate of deterioration depends on the weather during maturation and on harvesting, conditioning, and storage practices. Seed can deteriorate rapidly if excessive damage occurs during harvesting and conditioning (see Figure 9). Harvesting crops at the proper moisture content and keeping equipment adjusted will minimize mechanical injury to seed. Seed moisture levels for harvesting and conditioning are slightly higher than those recommended for safe storage (Table 2). Seed storage conditions, which can also greatly affect deterioration rates, is discussed in more detail in a later section. The quality of a seed lot can be improved by conditioning. Conditioning is used mainly to eliminate or reduce undesirable contaminants such as diseased and immature crop seed, weed seed, inert matter, broken or split seed, or other crop seed. In some crops, conditioning includes the addition of chemical seed treatment. Table 2. Safe Harvest and Storage Moisture for Seed Crops Common to North Carolina. 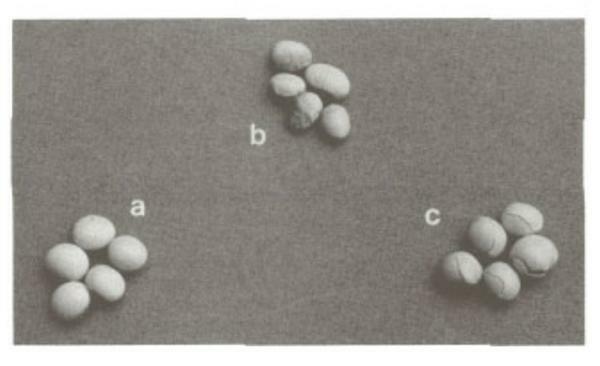 Figure 9: Soybean seed: (a) healthy and sound, (b) immature and weathered, and (c) cracked coats caused by mechanical impacts. Pathogens (organisms that cause disease) are often present on or in the seed or in the soil. These organisms can cause diseases that destroy the seed or seedling. Chemicals applied to the seed can prevent or reduce the harmful attacks of many pathogens. These treatments include fungicides, insecticides, and, occasionally, antibiotics. Fungicides are chemicals that are normally used to combat seed rots, surface molds, and seedling blights caused by seed- and soil-borne organisms. The ideal fungicide should be highly effective in controlling a specific disease organism. Insecticides are used to protect the seed from soil-borne insects and storage insects. Some treatments combine a fungicide with an insecticide to protect the seed against soil insects and disease organisms. The chemicals used should be harmless to seed, stable for long periods of time, easy to use, and low in toxicity to people and animals. Systemic treatments are absorbed by the seed or developing seedling. These treatments protect both the seed and the young plants against diseases. For example, Baytan, a seed treatment that became commercially available in 1990, protects wheat, barley, and oat plants from many foliar diseases (including powdery mildew and rust) for up to eight weeks after seedling emergence. Treatment chemicals are formulated as dusts, wettable powders, or liquids. The most important part of seed treatment is selecting the proper kind and form for a specific crop. A critical problem is obtaining uniform and adequate chemical coverage on each seed. Undertreatment is ineffective and overtreatment may injure the seed; therefore, accurate metering devices are necessary to dispense the proper amount of chemicals to a given quantity of seed. Many treatments are added by seed conditioners. However, several “hopper box” treatments are designed for easy on-farm use. If you are interested in treating specific crops, refer to the current North Carolina Agricultural Chemicals Manual for recommendations on rates and treatments. County Extension Service agents and other agricultural leaders can also recommend treatment methods. The North Carolina Crop Improvement Association (NCCIA) is legally responsible for seed certification in North Carolina and is the official seed certifying agency. The NCCIA, founded in 1929, establishes and administers the standards for certification. It also inspects and supervises the production, conditioning, and marketing of certified seed under those standards. The basic purpose of the production and sale of certified seed is to make genetically pure crop seed available to farmers. Genetic purity, or trueness to variety, is established and maintained by special purification and seed increase programs, by field and seed inspections, and by pedigreed records. Genetic purity is largely determined by production records and field inspections. Certified-1 and Certified-2 are the categories of certified seed. Both categories meet the same high standards for genetic purity, but they differ in quality standards such as gemination percentage. Certified- 1 must meet higher standards. A purchaser of certified seed normally receives a bonus because certified seed usually has a higher germination percentage, lower inert matter, virtually no weed seed, and a very low percentage of seed from other crops as compared to uncertified seed. The classes of seed in the certification program are breeder, foundation, registered, and certified. 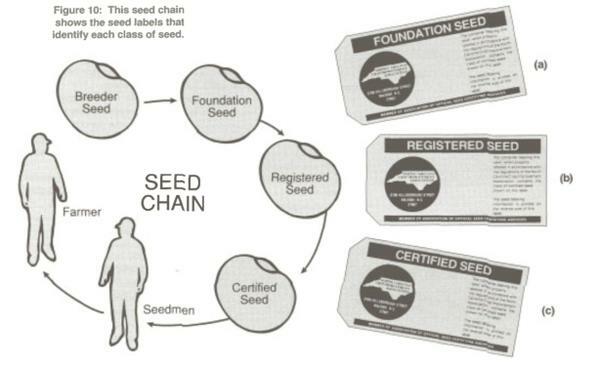 The process of increasing seed from the plant breeder’s program to “blue label” certified seed is referred to as the seed chain, as shown in Figure 10. Supplies of breeder seed are usually maintained by the originator of the variety. Most often, the amount of a given variety available usually does not exceed a few pounds or bushels. Seed of new varieties must be made available to farmers for use in their farming programs, and pure seed stocks of older but satisfactory varieties must be maintained. Certification offers a program of planned production, whereby desirable varietal and seed purity is maintained for a rapidly changing list of superior varieties. Breeder seed developed by public plant breeders is supplied to the North Carolina Foundation Seed Producers (NCFSP) for increase to produce foundation seed. The NCFSP increases the limited amounts of breeder seed available for each variety and makes the resulting foundation seed available to producers of registered or certified seed. The production of foundation seed is a highly specialized and closely supervised operation. Foundation seed lots do not normally enter routine trade channels. A white label with "Foundation Seed" boldly printed on it identifies foundation seed. A sample tag is shown in Figure 10a. Private seed companies that develop new varieties normally maintain their own breeder and foundation seed programs. Where certification is involved, these seeds are inspected by certification officials and must meet the same standards as seed varieties developed by public agencies. Seed produced from foundation seed is identified as registered, provided that it meets published standards of quality. Producers of registered seed are also highly specialized and must have considerable experience in seed production. In many crops, the registered seed producer must own certain conditioning equipment. Registered seed is identified by a purple seed label (Figure 10b). Either registered or foundation seed can be used for production of certified seed. Certified seed is produced under strict varietal purity standards and identified with a blue seed label (Figure 10c). A limited-generation plan assures that certified seed is no more than three generations from breeder seed. Because of this plan, certified seed is not eligible for recertification. After extensive field and laboratory inspection, this seed enters the normal channels of trade and is used by most leading farmers throughout North Carolina. Its genetic purity and high quality make certified seed the standard of excellence by which all seeds are judged. Membership in the NCCIA is open to qualified people or firms who want to grow certified seed. Members accept an obligation to uphold the high standards of certified seed and agree to abide by the rules and regulations of the NCCIA. NCCIA offices are located on the North Carolina State University campus in Raleigh. Sources of Certified Seed, published annually by the NCCTA, lists seed growers and the varieties they produce. This booklet can be very useful to seed dealers and agricultural workers in locating sources of certified seed. Copies of Sources of Certified Seed can be obtained from the NCCIA, 3709 Hillsborough Street, Raleigh, NC, 27607-5499. Figure 10: This seed chain shows the seed labels that identify each class of seed. The North Carolina Seed Law regulates the labeling of seed offered for sale. The basic purpose of the law is to prevent misrepresentation of the contents of a seed container. The seed law may be thought of as a “truth in labeling” law. A seed dealer should have a current copy of the North Carolina Seed Law and a copy of Title 2, Subchapter 48C (“Seeds”) of the North Carolina Administrative Code. These booklets will answer most questions relating to the North Carolina Seed Law and seed labeling. Copies can be obtained from the Seed Section, Plant Industry Division, North Carolina Department of Agriculture, PO Box 27647, Raleigh, NC 27611-7647. Seed offered for sale must meet certain minimum standards. For example, the minimum germination percentage for most crop seed and lawn and turfseed is 70 percent. Exceptions to this standard can be found in the current seed law regulations. Germination standards for vegetable seed vary considerably. These standards can also be found in Subchapter 48C. Seed lots that contain more than 1 percent weed seed are prohibited from sale in North Carolina. Certain weeds are classified as noxious and are prohibited or restricted in seed offered for sale. A list of noxious weeds is given in Table 3. The seed law does not limit the percentage of other crop seed that is contained in a bag of seed. Each land of crop seed or variety, however, that exceeds 5 percent of the total must be stated on the analysis label, and the pure seed and germination percentages of each must be given. Such seed lots are identified as “mixtures.” Inert matter percentage must be stated on the label but is not limited by the seed law. The seed law requires truthful labeling as to the contents of a container of seed. However, adherence to the seed law does not guarantee that seeds are of high quality, only that they meet the claims on the analysis label. Seed inspectors from the North Carolina Department of Agriculture & Consumer Services visit seed stores to ensure that seed is adequately and truthfully labeled. Stop-sale notices are issued for seed found to be in violation. A stop-sale notice prevents sale until the deficiencies are corrected through relabeling or reconditioning. If the seed is not brought up to standard, it is ordered removed from sale. To determine quality violations, the inspector takes a representative sample from the seed lot. This official sample is analyzed by the North Carolina Department of Agriculture & Consumer Services Seed Lab to determine if the entire seed lot meets label claims and is in compliance with the law. The seed inspector can be a valuable source of information for the dealer in keeping up to date on seed law changes and requirements. A common effort by the dealer and the inspector will provide the best seed. Table 3. Prohibited and restricted noxious weeds of North Carolina. As previously discussed, the seed law requires containers of seed offered for sale to be properly labeled. An example of an acceptable label format is shown in Figure 11.
the name and address of the individual or company labeling the seed (the vendor). Such information should be based on the germination and purity analysis testing of a representative sample taken from the seed lot. Vendors must keep a file sample and a complete record of seed that includes invoices showing lot number, kind and variety, origin, germination, purity, treatment, and the labeling of each lot for two years. Lot Number: This number allows the seed producer to identify a specific lot from which the seed was taken in case of performance problems. The term lot means a definite quantity of seed, identified by a lot number or other identification, that is uniform throughout for the factors that appear on the label. Net Weight: The weight given is that of the contents without the container. Kind and Variety: The kind of crop refers to the species (for example, wheat, cotton, and tobacco) and is always given on the seed label. The variety may or may not be stated. Under this definition, a hybrid name is acceptable as a variety name. If the variety is not given, the seed tag normally has the statement, “Variety not stated.” When two or more components are named, the word “mixture” or “mixed” must appear on the label. Origin: This label entry identifies the state or country in which the seed was grown. If the origin is unknown, a statement “origin unknown” must appear on the label. Pure Seed: This number tells what percentage of the total weight consists of seed of the kind and variety stated. If more than one kind or variety is named, the pure seed percentage of each component must be given. Generally, farmers choose seed with a high pure seed percentage (98 percent or more) and of one kind and variety. Inert Matter: This number indicates the percentage of extraneous material such as dirt, stems, leaves, and seed parts in the seed lot. Inert matter reduces the value of seed. It is best to choose seed with less than 2 percent inert matter. The standards for certification and state seed law requirements for labeling differ for some crop species. An inert matter percentage is not required for cotton, peanut, or tobacco seed in North Carolina. Other Crop Seed: This number indicates the percentage of the total weight made up of seed from a crop other than the kind and variety listed. In the field, other crop plants, such as corn in soybeans, may be as troublesome as weedy plants. High-quality seed should contain no seed from other crops or only a low percentage. Weed Seed: The presence of weed seed is expressed as a percentage of total weight. This classification includes seed, bulblets, or tubers of plants recognized as common weeds by official regulations or by general agreement. High-quality seed should contain only a very low percentage or no weed seed. Germination: The percentage of pure seed that germinates in a standard germination test is printed on the analysis label. This percentage is based on the number of seeds that produced normal seedlings during the test. A normal seedling is one that has the essential seed structures necessary for plant survival. Germination percentage is based on pure seed and not on the total contents of the bag. If more than one kind and variety is named, the germination percentage must be shown for each kind and variety. Choose seed that is high in germination (80 percent or more). Hard Seed: This number indicates the percentage of seed that remains hard during the germination test. It is assumed that most hard seed will germinate, but that is not necessarily the case. Hard seededness is a characteristic of certain species (especially legumes) and is caused by water-impermeable seed coats. Where hard seeds are present, total germination percentages are customarily determined by combining germination and hard seed percentages. Test Date: This date reveals the month and year in which the germination test was completed. The law requires that the germination test be made within nine months (not counting the month of the test) of the date the seed is offered for sale. For vegetable seed in hermetically sealed containers, tests are required every 24 months, not counting the month tested. Be sure to purchase seed with a current germination test date. The law also requires the individual or company owning the seed to maintain a current germination test date. Therefore, dealers with carryover seed should have their seed retested and relabeled before the test date expires. Noxious Weed Seed: Noxious weeds are plants that are extremely difficult to control with normal cultural practices. A noxious weed seed list has been established by the North Carolina Board of Agriculture. The name and number of restricted noxious weed seeds, bulblets, or tubers per pound of crop seed must be printed on the seed label. In North Carolina, the noxious weed seed list includes prohibited and restricted noxious weeds. Seed containing any seed or tubers of prohibited noxious weed seed cannot legally be sold in the state. Restricted noxious weed seeds are permitted in crop seed, but the number of weed seed permitted per pound of crop seed is limited. Noxious weed seed and their limitations in crop seed are listed in Table 3. High-quality seed contains no noxious weed seed. Seedsman or Vendor: The name and address of the person or company labeling the seed are given on the seed label. They are responsible for the accuracy of the label’s information. Treated Seed: All seed that is treated with chemicals must be labeled to show the chemical used. 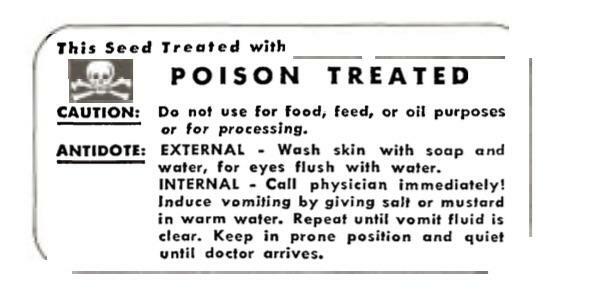 Either “Caution,” “Poison,” or “Poison Treated” must be written on the label, depending on the harmfulness of the seed treatment to humans. The statement “Do not use for food, feed, or oil purposes” is printed on labels for treated seed (Figure 12). Chemically treated seed is also required by law to be dyed a bright color. 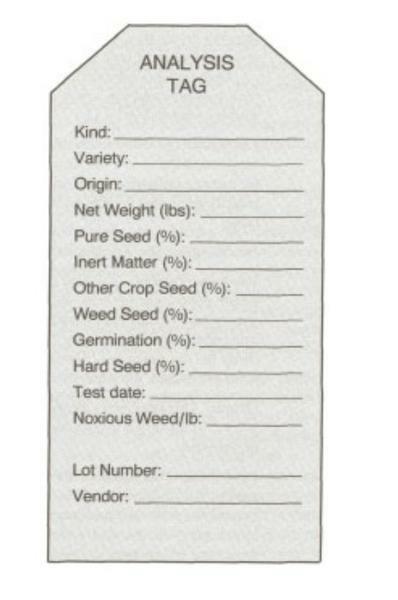 Figure 11: The seed label serves as a means of communication between the buyer and seller. Figure 12: Chemically-treated seed must have a warning label to make the user aware of the dangers involved in handling such seed. Farmers in North Carolina sometimes save their seed for planting in the next season or sell it to their neighbors. These practices are usually legal, but whenever seed is offered for sale, state and federal laws come into play. These laws include the Plant Variety Protection Act, Title V of the Federal Seed Act, and the North Carolina Seed Act. Farmers and Extension agents need to be aware of and understand the seed laws. The federal Plant Variety Protection Act (PVPA) was passed in 1970 to give the breeder of a protected variety the exclusive right to reproduce and market that seed for planting. A civil suit may be brought against any person infringing upon the owner’s exclusive rights to protected seed. Dispensing the variety without indicating that it is protected. A seed conditioner can clean seed of a protected variety for a farmer, but it is a violation for the conditioner to seek out potential buyers or sellers of this seed or even to make it known that they hold any such seed for purchase. The owner of a protected variety may choose additional protection through the certification option of the PVPA. Through this option, the variety owner can specify that the variety is to be sold by variety name only as a class of certified seed. Any person who sells, offers for sale, or advertises for sale by variety name uncertified seed of that variety violates the North Carolina Seed Law and Title V of the Federal Seed Act. Title V protection is enforced by the regulatory section of the NCDA&CS and the USDA Seed Branch. Under the crop exemption clause of the PVPA, a farmer can use and sell reproduced or multiplied seed to another grower, provided that neither is in the seed business and that the sale complies with state seed laws. In North Carolina, however, if you advertise seed for sale, you become a retail seed dealer and must purchase a seed license. The crop exemption clause does not permit uncertified seed of a variety with the Certification Option of the PVPA to be advertised by variety name. Farmers should be aware that the sale of uncertified seed of any protected variety by kind name may still be a violation of the owner’s civil rights, and the owner could bring civil suit against the seller. Most crop seed is stored for some period of time. During this time, seed may deteriorate considerably. Good storage conditions can slow the rate of deterioration, but seed germination and vigor cannot be improved, regardless of the storage facilities. Many costly storage problems actually begin during field exposure, harvesting, and conditioning of the seed. Excessive harvesting delays, mechanical injuries, and improper drying techniques, followed by poor storage conditions, can lead to rapid deterioration of seed germination and vigor. Different species of seed have different storage lives. The storage life of seeds ranges from several hours (as in some tropical tree species, whose seed loses viability when dried) to several thousand years (as in the case of the Indian Lotus). Typically, the storage life of crop seed ranges from 1 to 20 years under ideal storage conditions. For example, peanut seed has been stored in the laboratory under special refrigerated conditions for as long as 10 years, and in normal laboratory storage, it survives for two to three years. In contrast, peanuts stored under conventional commercial conditions survive for only five to seven months. Seeds that have high oil contents, such as peanuts and soybeans, are relatively shortlived under conventional conditions. These species are not normally carried over from one planting season to the next. Other legumes, such as clover and alfalfa, and grasses, such as corn and wheat, can be carried over from one planting season to the next if stored in the proper environment. Seed deterioration cannot be put off indefinitely. The general pattern of seed deterioration is illustrated in Figure 13. 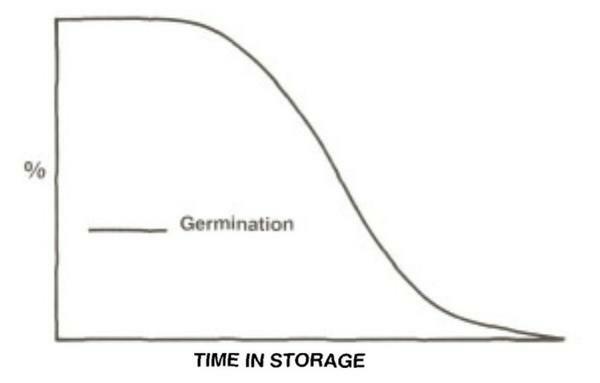 Germination remains unchanged for a period of time during storage and then declines rapidly. The fundamental relationship between seed vigor and seed germination is shown in Figure 14. As seeds age, both germination and vigor decline, slowly at first and then more rapidly as the end of the seed’s useful life is reached. Vigor declines faster than germination. One of the problems in seed research has been finding good vigor tests that will give extra information about the seed. Advances have been made in vigor testing for many of the agronomically important crops. For example, the cold test for corn, the cool test for cotton, and the accelerated aging test for soybeans have proven to be reliable vigor tests that correlate very well with storage life and field emergence. These tests are used mainly for in-house quality control and evaluation of the overall quality of seed lots. No effort has been made to include seed vigor test results on seed labels. Deterioration is slowed when seeds are stored under cool, dry conditions. Temperature and relative humidity should therefore be considered in planning for safe storage. A rough rule of thumb for safe seed storage is that the sum of the temperature (°F) and relative humidity should not exceed 100 units. For example, if the temperature is 60°F, the relative humidity should not be over 40 percent. Seed moisture is the most important factor affecting seed longevity. Seeds adjust their moisture content until they are in equilibrium with the surrounding storage environment. Temperature and relative humidity affect the amount of moisture in the air and will influence the equilibrium moisture content of seed. For example, the equilibrium moisture content of corn at 77°F and 45 percent relative humidity is 10 percent; whereas, at 77°F and 90 percent relative humidity, it is 19 percent. Under the same conditions, soybeans have a moisture content of 7 and 18 percent, respectively. The reason for the difference in moisture content is due to variation in the chemical composition of the seed. See Table 4 for equilibrium moisture contents of several crop species commonly grown in North Carolina. Table 4. Equilibrium Moisture Content of Seed Commonly Produced or Stored in North Carolina. A general rule is that each 1 percent decrease in moisture content of the seed nearly doubles the safe storage period. Thus it is important to put dry seed into storage and keep it dry. Many companies are finding it profitable to vacuum pack their seed, especially vegetable seed that is marketed in small containers. Seed in such containers may remain viable for several years. Generally, the moisture content of seed sealed in vacuum packed containers should be 2 to 4 percent lower than that required for conventional storage. Low temperatures are also desirable for maintaining seed viability. Each 10°F decrease in temperature will roughly double the safe storage period. If both temperature and moisture cannot be regulated, then moisture is the most critical factor to be controlled. Often, seeds that are carried over during the summer months in bulk or bin storage are exposed to extremely high temperatures. It is critical that these seeds be low in moisture (8 to 10 percent) when placed in storage. These seeds also need protection from insect attack. A variety of insecticides can be used for protection. Nonflammable fumigants are sometimes used for controlling insects in stored seeds. For example, methyl bromide is frequently used to fumigate warehouses and bins. If seed moisture is too high, however, some damage to viability can occur when methyl bromide is used. Special care should be used with this and all other fumigants to prevent seed damage. Refer to the current North Carolina Agricultural Chemicals Manual or contact your county Extension agent for current recommendations. Figure 13: Loss of germination potential during storage. 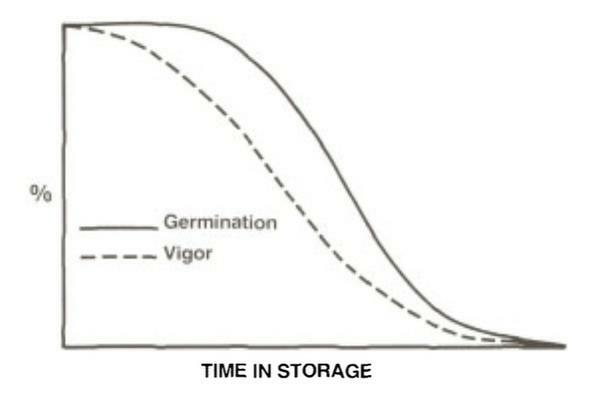 Figure 14: Relationship between seed germination and seed vigor during storage. Seed usually represents a relatively small part of the monetary cost of producing a crop. Generally, the investment is less than 2 percent of all crop production expenses. Yet the profit at harvest depends heavily upon the choice of seed for planting. What factors should be considered when choosing seed? Each quality characteristic is important. Whether you are buying or selling seed,you should establish an acceptable quality level for each characteristic. The first step in choosing seed is to select the best adapted variety. The importance of this decision cannot be overemphasized. The variety choice and the quality of the seed set an upper limit on yield and crop quality. Some farmers who grow considerable acreage of a crop like to plant several varieties. This practice spreads out the use of labor and other valuable resources, as well as the risk of crop failure due to an insect or disease outbreak or unfavorable weather. Seed dealers can use many aids to help farmers select an adapted variety. Commercial literature is usually available from dealers. The Measured Crop Performance bulletins published by North Carolina State University are a good source of information on variety performance. Copies are available from county Extension Service offices. In addition, seed dealers should have a current copy of Sources of Certified Seed as a reference. This publication is available from the NCCIA office in Raleigh. Normally, varietal purity cannot be determined by laboratory tests. Purity can best be determined by keeping accurate records of production and by conducting field inspections during the growing season. Your best assurance of varietal purity is through the use of certified seed. Seed label information reveals some of the important characteristics to consider in choosing seed. It is difficult, however, to establish definite standards for these characteristics. The general rule is to choose seed that is true to variety, has a high germination rate (above 80 percent), and high purity (98 percent or more). It is important to choose seed that is low (2 percent or less) in total contaminants such as inert matter, weed seed, and other crop seed. Germination and other soundness characteristics may vary from season to season, In many crops, seed dealers and farmers have to accept the germination and soundness quality available. It takes careful searching to find the best seed. The reputation of a seed wholesaler or local producer is rated in relation to the quality of seed sold. Retail seed dealers should patronize those wholesalers who most consistently supply high-quality seed. Computing the planting value of different lots of seed in this manner shows that high-quality seed is usually the best buy. “Brown-bag” or “bootleg” seed is often of inferior quality. It is never a good practice to purchase or plant seed of any crop if quality information is not available. Likewise, it is important to test any grain you are considering as planting stock for the next season. Damage done to seed while planting is often overlooked. With modern equipment, the speed at which planting can be done is considered a measure of efficiency. High planter-plate speeds, however, can cause considerable damage to the seed. Be sure to check planting equipment and planting procedures often to assure that no damage is being done. Seed size varies considerably within and between species and even between varieties, so it is a good practice to check equipment manuals for planter-plate recommendations. Land preparation is also a part of good planting practices. A smooth, firm seedbed will permit uniform seeding at proper depth. Uniform planting depth is important for a uniform emergence pattern. Depth settings are especially critical with multiple-row planting equipment. Most crops are planted to achieve a given population of healthy plants per unit of ground area. Current recommendations for seeding rates and time of planting should be followed for each crop. County Extension agents and seed dealers are often called upon by farmers who have crop stand problems. Farmers often feel that the seeds were at fault if the stand is below an acceptable level. It is good for all parties involved to determine the true cause of the crop stand problem. Stand problems should be analyzed in three general areas: (1) the seed; (2) planting procedures, including such things as planting equipment and methods, use of chemicals, and fertilizer placement; and (3) weather and soil conditions at planting and shortly thereafter. In analyzing seedling establishment problems, all possibilities should be considered. It is important that the facts in each case be gathered as soon as the complaint is made. It is difficult to obtain reliable information about seed problems after the crop has been harvested and sold. Most seed-related complaints deal with stand failure. If the seed is at fault, such a failure would be fairly uniform across the field. It is a good idea to have the seed tested if any remains. It should be tested right away because the leftover seed might have been improperly stored or mechanically damaged and will not give a true picture of what the quality was like at the time it was planted. Many times there is no seed left. If the lot number of the seed is known, however, the seed dealer may have more seed of the same lot that can be tested. Also, if the seed is of a certified variety, the NCCIA will have records of past germination tests. It must be understood, however, that a seed test must be made by NCDA&CS representatives from samples taken from unopened bags to be official. Disputes cannot be settled by testing leftover seed. Another possible cause of stand failure is planting depth. Depth is important because temperatures, moisture, and aeration vary with depth. If planted too deep, the seed may have adequate moisture and air for germination but not a favorable temperature. Also, the seed of many crop species does not have the ability to emerge from great depths. Under such conditions, seed or seedlings are likely to decay. Stand failures caused by planter injury, fertilizers, and chemicals are often not uniform in the field. Such failures are characterized by areas of excellent stands and areas of poor stands. Multiple-row planting equipment creates additional problems in trying to adjust each planter to the same specifications such as depth and spacing. Many fields have been observed with good stands in two or four rows alternating with poor stands in the next two or four rows. Adverse weather and soil conditions can cause stand failures. Widely fluctuating temperatures or moisture levels during the seed germination period can affect seedling emergence. Under these conditions stand failures may be variable across a field, particularly if the field contains several soil types. Soil insects and insecticides create germination problems in some crops. It is always a good practice to read the labels of any pesticide applied to the soil or young seedlings to prevent harmful side effects. It is critical that information about all chemicals and rates be examined. Some soil fumigants require a waiting period before crop seed can be planted safely. If these intervals are not observed, slow germination and spotty emergence may result. Soil-applied herbicides used on previous crops may cause carryover injury. Always read pesticide labels carefully, and follow all directions. Occasionally, complaints arise relating to varietal purity. Such complaints should be analyzed as quickly as possible. Again, it is important to be able to identify the specific seed or seed lot used in planting. Make it a practice to save seed tags from all seed planted. Seeds are complex, living organisms that play a very important role in agriculture. High-quality seed lots of adapted varieties are the result of breeding, research, and careful management during all phases of seed production. The North Carolina Cooperative Extension recommends that everyone who depends on crops for a living, as well as homeowners establishing lawns and gardens, consider seed selection as the first step in production. Variety selection and seed quality set the maximum performance level for all plants. plant the seed when soil conditions are favorable, thus promoting rapid germination and seedling growth. Foil W. McLaughlin, Director of the North Carolina Crop Improvement Association, passed away on August 7, 1991. Foil dedicated his career to the production and promotion of certified seed and was a strong supporter of the North Carolina Cooperative Extension at both the state and county levels. He was instrumental in developing the Plant Variety Protection Act and in incorporating this into the Federal Seed Act. The impact of Foil's work was felt not only in North Carolina but around the world. Foil McLaughlin's contribution to this bulletin goes far beyond the single chapter on Certification. Indeed his input and sound advice have been beneficial in many areas of the Seed Extension Program. We dedicate this bulletin to the memory of Foil McLaughlin.